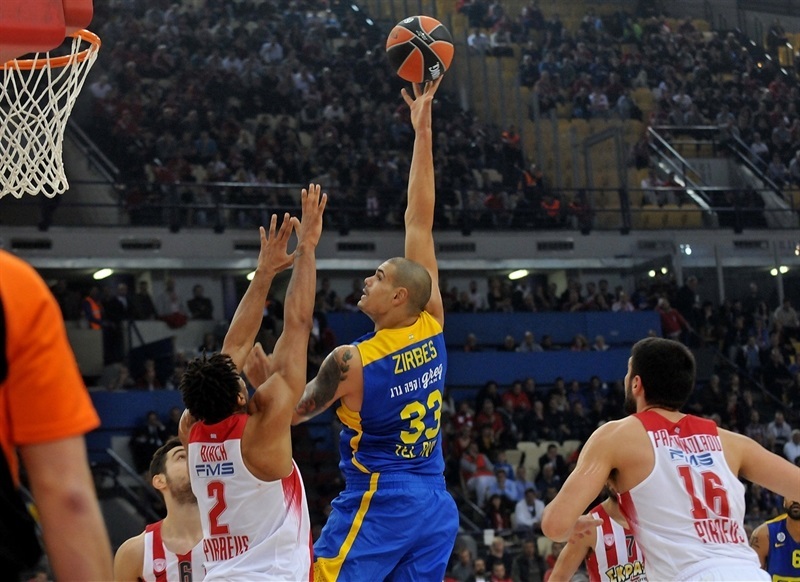 Maccabi FOX Tel Aviv won its third straight Turkish Airlines EuroLeague game by beating Olympiacos Piraeus 73-80 at Peace and Friendship Stadium on Thursday. 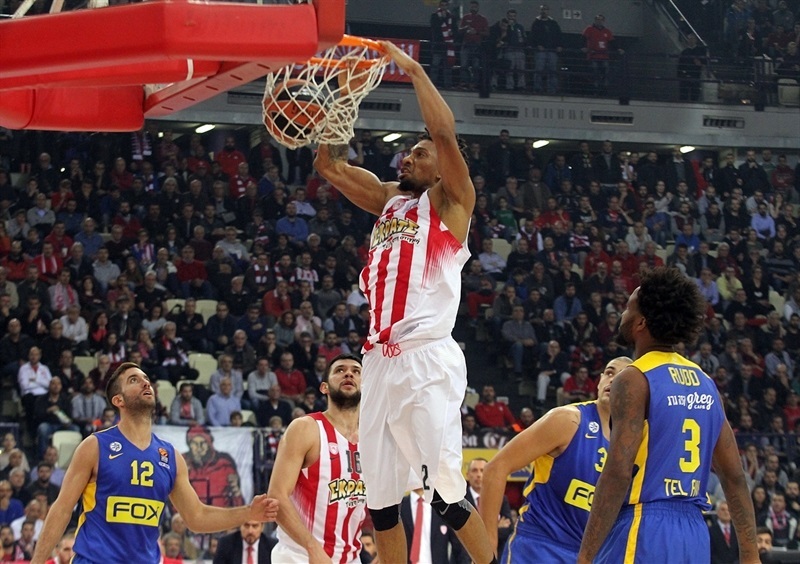 D. J. Seeley made 5 of 8 three-pointers en route to a season-high 19 points to pace Maccabi, which improved to 5-4. The Reds are also 5-4 after losing at home for the second time this season. 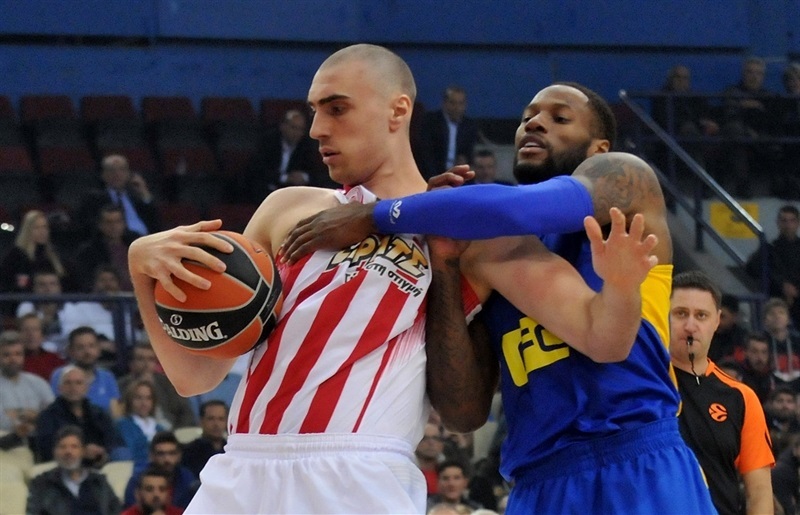 The visitors opened up a double-digit lead already in the first quarter, led by as many as 18 in the third and held off a late Olympiacos push to claim the win. 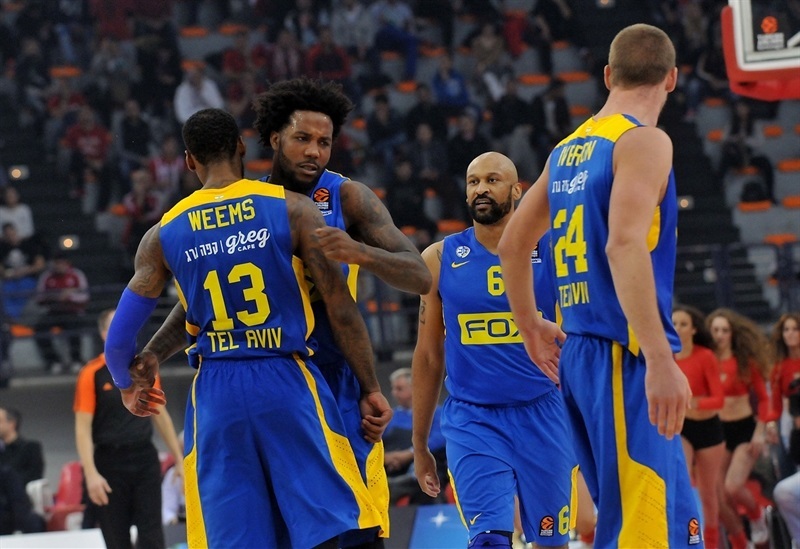 Maccabi outrebounded its opponent 35-43 and limited the home team to 6-of-33 three-point shooting (18.2%). Colton Iverson amassed 14 points on perfect shooting plus 8 rebounds, Sonny Weems collected 12 points and 6 assists, Andrew Goudelock also scored 12 and Devin Smith tallied 10 points and 10 boards. 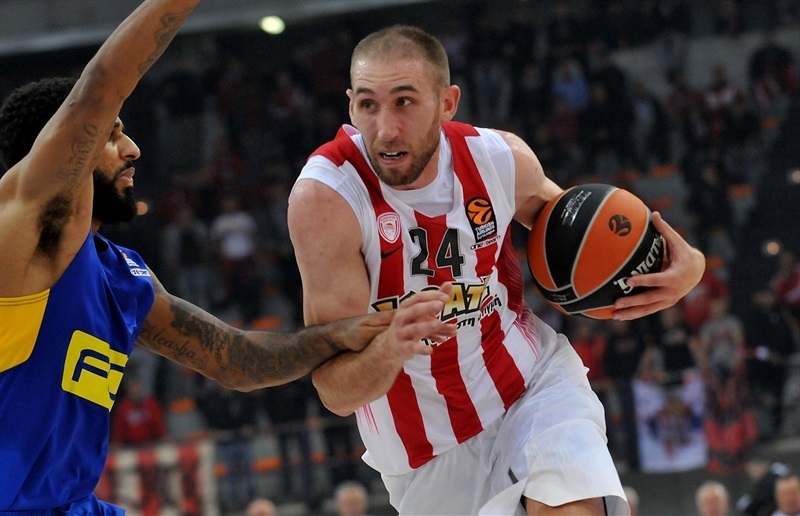 Matt Lojeski paced Olympiacos with 15 points, Vassilis Spanoulis scored 14 and Erick Green added 10 in defeat. Smith drilled a pair of triples in a 0-8 Maccabi run that made it 5-12 after four minutes of action. 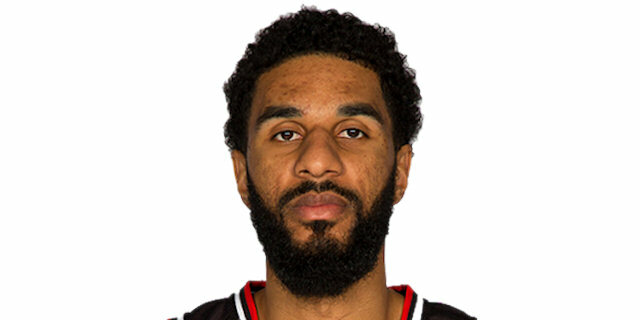 Seeley’s first three boosted the margin to double figures, but the Reds went on a 7-0 push capped by a monster slam by Khem Birch to get within 16-20. Ioannis Papapetrou free throws ended the first quarter at 20-24. Strong play by Iverson helped the visitors remain in front and Seeley added a pair of threes to make it 31-38. 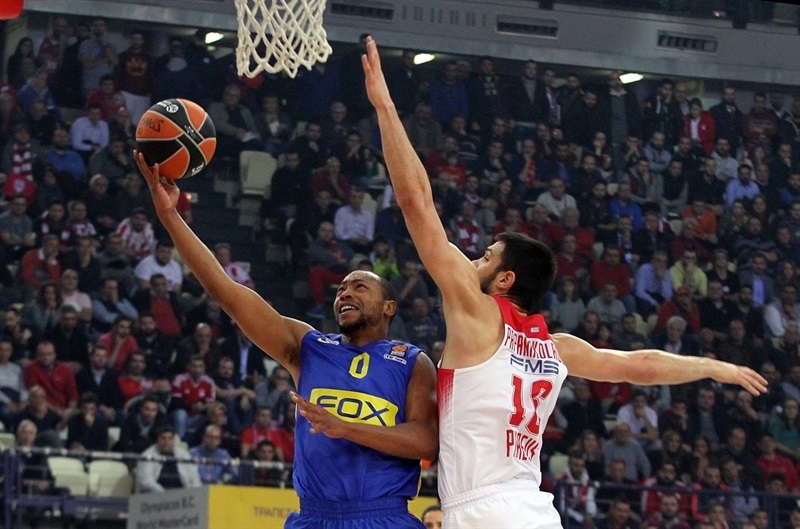 Maccabi remained in control, 37-44, at the break. Dunks by Weems and Victor Rudd in the first minute of the third quarter reestablished a double-digit cushion. 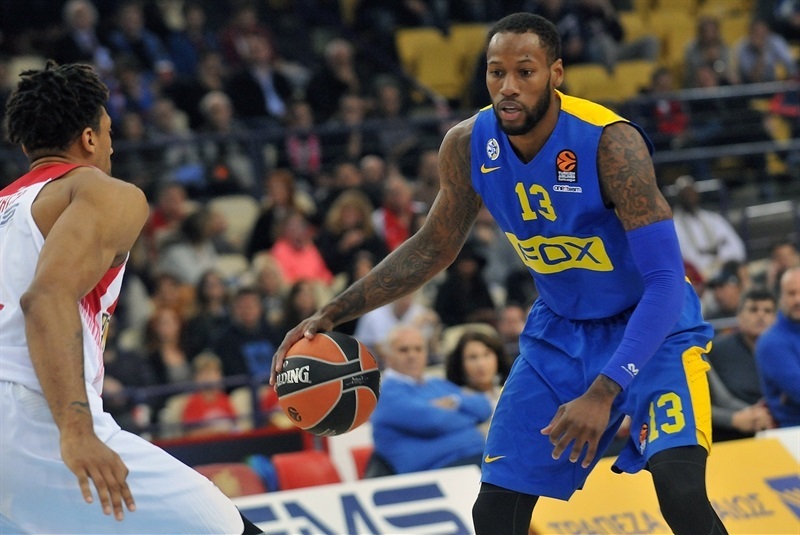 It took nearly four minutes for the home team to get on the board in the second half, but even after that Maccabi continued to pile on and stretched the difference to 40-57. Little changed after that as the yellow-and-blue crew took a 49-65 edge through three quarters. 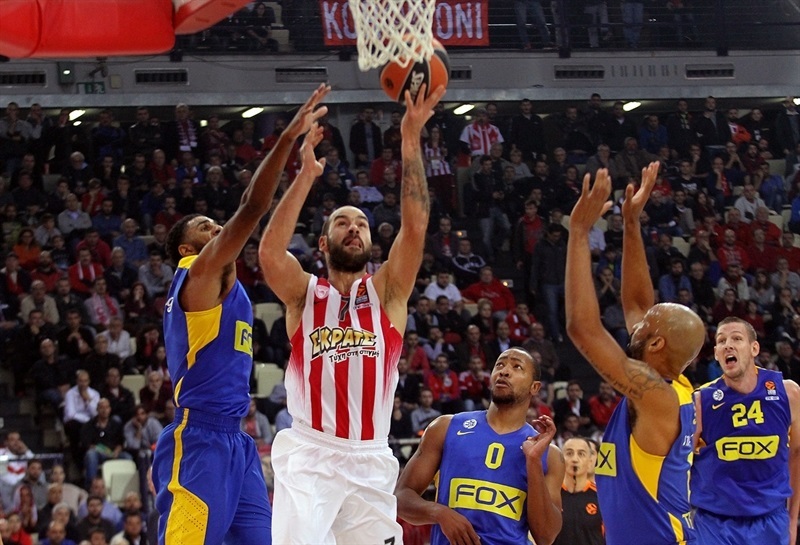 The difference reached 18 before Olympiacos mounted a late charge to make it 61-72 with three minutes to go on a long Spanoulis jumper. 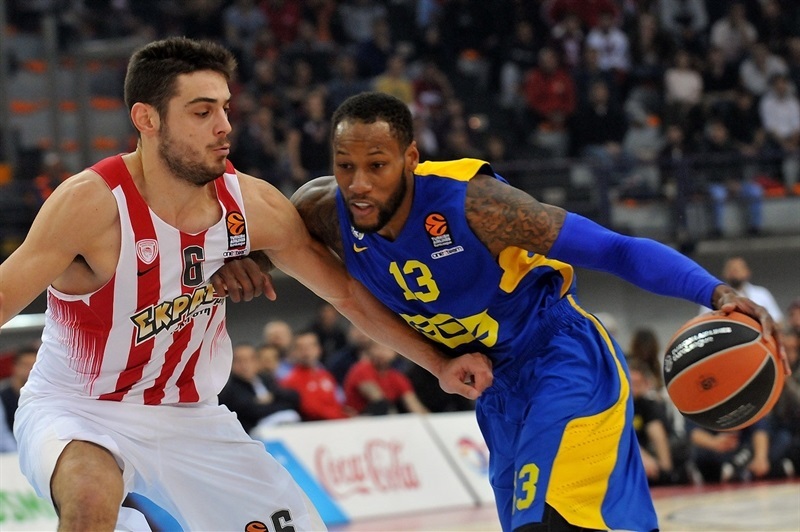 The hosts managed to get within 6 in the closing seconds, but the comeback proved to be too little, too late as Maccabi raced home with the victory. "This is a night that nothing went well for our team. We played against a team that we knew is very athletic, will push the tempo and go a lot in the open court. A lot of isolations and a lot of uptempo game. From one side, we did not start good defensively; we let them score one-on-one tough baskets, but easy. We were not aggressive. From the other side on offense we lost our concentration. Maccabi packed the paint, they tried not to give us layups, so we had a lot of open shorts that we missed. And as the game was going on, we started to be nervous to shoot from outside. We missed a lot of open shots, so that hurt us and hurt our defense more. Although in halftime we tried to restart our offense and defense, in the beginning of the second half was very bad. The beginning of the third period we were bad offensively and defensively and they scored a lot of easy points. They got a bigger lead. We tried to press at the end. We played with five guards, we cut down the difference, but we didn’t do anything more. Maccabi deserved to win. " 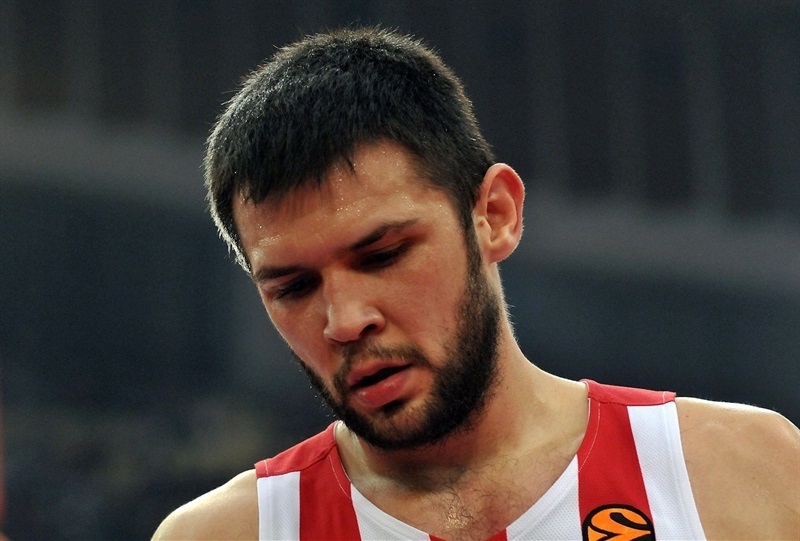 "I think that most of the game we played excellent defense. Until the last quarter we played perfect on defense and that gave us the victory. I have capable players to play defense. We are making progress defensively. We are forcing the other teams to play a set game, we are forcing their percentages down, but it’s not there yet." 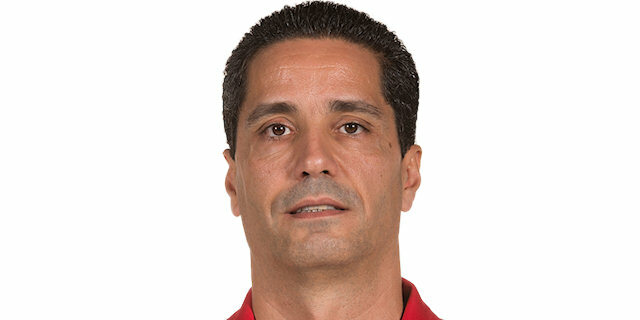 "I think this win is a combination of the process that we are going through in Maccabi in two parameters. One is basketball – offense, defense, tactics. And the other is the spirit. The guys played hard, they played accurate according to the game plan and I salute them for the effort." We just came out here and played aggressive on defense from the jump and we set the tone for the game. We know we could play offense, but we struggled on defense in the beginning of the season. We all just got together and said the key to winning is defense, because we got a lot of players that can score, so we need to clamp down on defense.